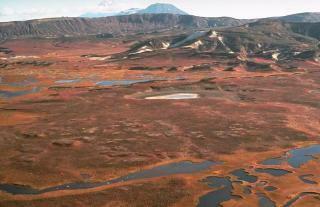 The Volcanoes of Kamchatka are one of the most outstanding examples of the volcanic regions in the world. The Kamchatka River and the surrounding Central Valley are flanked by large volcanic ranges, containing around 160 volcanoes, 29 of them still active. Thus, the peninsula has perhaps the highest density of volcanos and associated volcanic phenomena in the world, with 19 active volcanos being included on the World Heritage List. This is one of those WHS that truly deserve a trip of their own and contain so many parts and places that even with a week at your disposal, you'll be able to just cover couple of those places. I visited the Kamchatka peninsula this August with my husband Ivan. It consists of numerous nature parks/reserves and places. We started with the ascend to Avachinskiy volcano (2000m altitude hike over 8 km track), hiked around Dachniye springs (by the Mutnovskiy geothermal station), did a helicopter tour of the Valley of Geysirs and hiked the Gorelyi volcano. The nature is marvellous and out of the three "top" mainland Russia natural UNESCO WHSs, Altai, Lake Baikal, and Kamchatka, I have to hand it to Kamchatka as the most wonderful of the three. It's a beautiful place that will leave even seasoned nature lovers amazed. As for the technical part of all of the tours, you get your plane ticket, if it's from Moscow, check a stopover in Yakutsk as an option, it will reduce the price of the overall ticket significantly. The return way is cheaper as it's subsidised. The accomodation and trip is arranged by one of the local travel agencies, we chose Kamchatintour. The service is quite mediocre, not very well organised, pickups don't arrive on time and the length of the ride with Kamaz (which is required for most of the destinations) depends on the driver on duty that day. What we covered in mere three hours one day took us over four the other. Many people stay in small resort of Paratunka where there are couple of overpriced mediocre hotels or in Petropavlovsk Kamchatskiy, but it takes longer to get to the places of interest, i.e. Elisevo airfield, base camps of volcaones, etc. There are hikes available for all levels of fitness, i.e. you can do the Avachinsky volcano hike, either all the way (2000 m altitude gain) or to two thirds point (1200 m altitude gain) or hike a small Camel foothil with elevation gain over 300 m. Get info on each of the hike as they would say it's for everyone, even the most difficult ones and judge your abilities accordingly. The helicopter tours are the same price regardless of whether you book with the operator or tour agency as there is only one operator, Vityaz Aero. The itinerary consists of numerous day or two day trips which you can pick and mix according to what's available with your tour agency. I would strongly recommend choosing a helicopter ride for the first couple of days of your tour as the weather might get bad and the sky above Kamchatka closed for a day or two, so if that happens, you'd still have the chance to rebook. There is a limited number of English speakers in most of the tour agencies so book ahead and make sure you're getting into English group if nobody in your party speaks Russian. Glaciers: AB review "Other distinguishing land-form features of the area include its many lakes and rivers and the large number of glaciers that occur on the volcanoes and the important role they have in studies of climate change"
Recently Active Volcanoes: According to the original AB 1996 evaluation "Kamchatka has 29 Active volcanoes of which 19 are within the nominated area". The 2001 extension is said to have added another cluster of 12 (No it doesn't add up!). Avachinsky is one of the most active - It has erupted at least 17 times in the recorded history of Kamchatka. There was a major eruption in 1945. The last one was 2001. 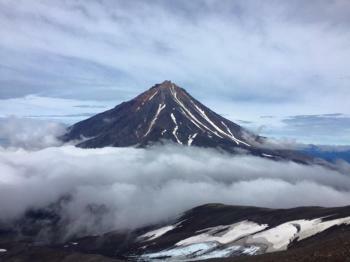 Together with nearby Koryaksky it is a "Decade Volcano"